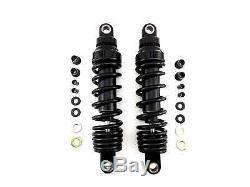 HARLEY FXDB DYNA STREET BOB 11.5 INCH JBS HD TOURING SHOCK ABSORBERS BLK. Total Length: 320mm (12.70") Eye to Eye: 290mm (11.50") Eye Diameter Top: 1/2" Eye Diameter Bottom: 1/2" + Optional 3/8 eye inserts Eye Width : 30mm Spring thickness: 9.10mm Spring Width: 72.00mm Working stroke: 60.00mm Spring Preload adjustment Adjustable by Hand Max loading: 480kg / 1050lbs. 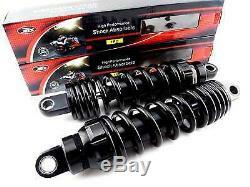 2 x JBS HD Touring Shock Absorbers 2 x ½ Inch Eye's (inc 4mm spacer) 2 x 3/8 Inch Eye's (Optional) 2 x 8mm Spacers 2 x 2.5mm Flat Washers. Harley Davidson FXDB Dyna Street Bob (2006 2016). Please ensure you understand the different features of each service. (Only available to select locations). Please note, delays are common for countries located within the EU and South America. While these delays are ultimately out of our control we are always happy to assist where possible. Items that we do not normally carry in stock are considered "Backorder Items". In general Back ordered items will include, but are not limited to, any items that are manufactured specifically to your requirements, any items which are ordered by us from overseas on your behalf and any non-stock items. All Backorder Items are non-returnable and cannot be cancelled. We will only accept cancellation of your order if. The items on it are ones which we would normally hold in stock. The items on it are NOT Backorder Only items which we have had to order in on your behalf. We also accept payments via direct bank deposit. Items will be dispatched only after funds have cleared. JapBikeSpares respects your privacy and will keep all of your personal details secure and confidential. Any information you submit is only used in order to process your order. You must obtain verbal permission from JapBikeSpares prior to returning any goods. You must take reasonable care to ensure that the goods are not damaged whilst in return transit to us. You are responsible for any loss or damage caused as such, we therefore strongly recommend that you use an insured carrier service to return the goods to us. You do not however have the right to return your goods under any of the following conditions. If the goods have been installed, used or fitted in any way whatsoever. If the order was for any non-stock special order goods ordered specifically and/or manufactured specifically for you on your instructions. Please note that we will not accept items for return that have been installed, used or fitted in any way under any circumstances. Order shortages and carrier damages. Please advise us of any shortages or carrier damage to insured items within 3 days of receipt of your goods. We regret that beyond this time we may be unable to process your claim. Should any goods be damaged in transit you must allow us and/or our carriers reasonable access to the goods and packaging so that your claim can be substantiated. At JapBikeSpares we take great pride in providing our customers with not only the very best quality products but also top class service to back them up. Your enquiries are always welcome and will be answered promptly by one of our customer service staff. 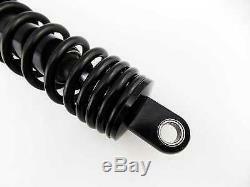 The item "HARLEY FXDB DYNA STREET BOB 11.5 INCH JBS HD TOURING SHOCK ABSORBERS BLK" is in sale since Monday, October 3, 2016. 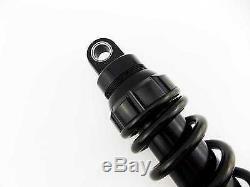 This item is in the category "Vehicle Parts & Accessories\Motorcycle Parts\Brakes & Suspension\Shocks". 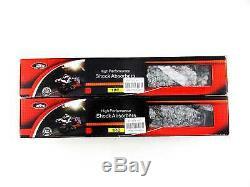 The seller is "japbikespares_oz" and is located in Brisbane, Qld. This item can be shipped to Australia, North, South, or Latin America, all countries in Europe, all countries in continental Asia, New Zealand.